The crucial semi-finals of SAFF Suzuki Cup 2018 will take place today at Bangabandhu National Stadium in the capital where Nepal, Maldives, India and Pakistan, all will be targeting the final two place of the tournament. In the first semi-final of the day, Group A leader Nepal will take on a lucky Maldivian side who have claimed the semi spot by the virtue of a coin toss as both Sri Lanka and Maldives finished the group stage with equal points. The match will kick off at 4:00pm. Nepal had a shaky beginning in the tournament with 1-2 defeat to Pakistan but came back strongly in the second match to beat Bhutan by 4-0. They cemented their place in the semi-final by shocking hosts Bangladesh by 2-0 goals. Their counterpart Maldives played out to a goalless draw with Sri Lanka in their first match and lost 0-2 to India in their second group encounter. In the day’s second semi, defending champions India will lock horns with their arch rival Pakistan at 7:00pm. India are the only unbeaten side of the tournament with two 2-0 victories against Sri Lanka and Maldives on the group stage. Meanwhile, Pakistan survived a 0-1 defeat to Bangladesh in the group stage before claiming semi ticket with 3-0 win over Bhutan. Out of the 23 times the two sides have met, India has won ten matches, ten matches were drawn and three were won by Pakistan. 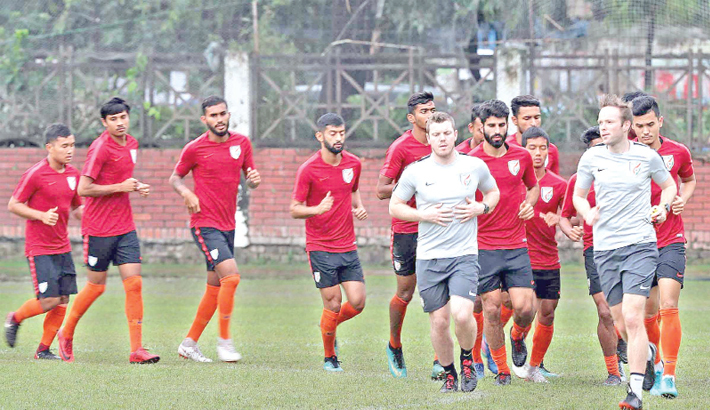 The last time the two rivals faced each other was five years back in the 2013 SAFF championship in Nepal, and India clinched the SAFF title beating Pakistan by a solitary goal in the final.